Thermal Imaging is used to get the temperature map of a test specimen. 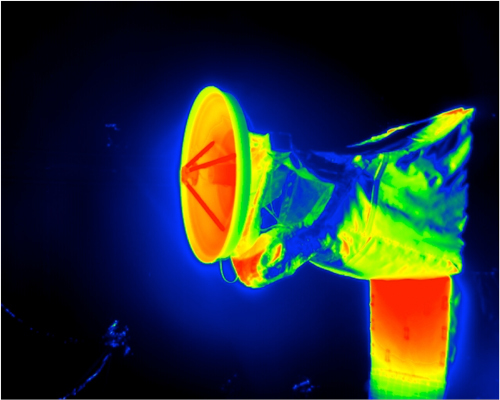 Thermal Imaging can be performed either at ambient conditions or in Thermal Vacuum (TVAC). Medium Wavelength (MW) and Long Wavelength (LW) Infrared (IR) cameras allow a wide temperature range to be covered. The available acquisition systems and camera enclosures make the simultaneous IR acquisitions with more than one camera in TVAC conditions, possible. Band Pass filters mounted on the MW cameras have been selected in order to acquire IR images also when the sun simulator is operating. An Off-the-Shelf software is used to set the parameters of the cameras and to manage the recording as well as to process the acquired IR images and extract temperature maps. Thanks to the data storing mechanism implemented by the Off-the-Shelf software, acquisition can be running unattended for days. Finally, an ad hoc test bench is available to measure the emissivity of the materials under test in the bandwidth of the selected IR camera. 3D Thermography capabilities have also been investigated. Upon request, further development for ad-hoc testing can be offered.